I love to eat and always look forward to sampling new and different foods. I try to stay towards more natural fare as I believe in the old adage “You are what you eat”. I recently had the chance to try out some food items from Pamela’s Products, the makers of great tasting, all natural, wheat-free and gluten-free foods. Yum! If you have tried all natural or gluten free products in the past, you may be thinking that they tasted “off” or just plain disgusting. That’s the issue that Pamela’s Products was created on. The founder, Pamela, did not have food allergies, but did eat different type of foods because her family was into the natural food industry. For instance she ate carob instead of chocolate and 9 grain bread instead of white bread. She went on a search for foods that she loved to make them gluten free. So in 1988 after finishing college, she started Pamela’s Products to offer wheat and gluten free food that tastes better- actually it’s delicious! 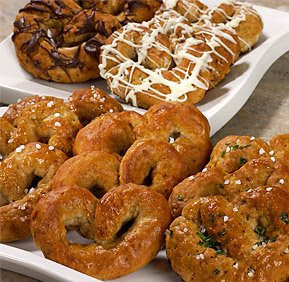 Pamela’s Products has a multitude of tempting mixes including 21 types of cookies (think Butter Shortbread, Chunky Chocolate Chip), 3 types of Biscotti, and 9 baking mixes including Cake mixes and Bread mixes. You may ask why gluten-free? 3 million people are affected by gluten either through Celiac Disease, Autism or food allergies. In fact over 2% of the population has food allergies. Many people are not able to digest gluten even in trace amounts in any form. Gluten is a protein found in grains such as wheat, rye, oats and barley. I had the opportunity to try out three products from Pamela’s Products line: Cornbread & Muffin Mix, Chocolate Brownie Mix and Lemon Almond Biscotti. I was skeptical at first trying a healthier product because I have had bad experiences in the past, but I was actually blown away. The taste was out of this world! Each was fabulous in it’s own right. 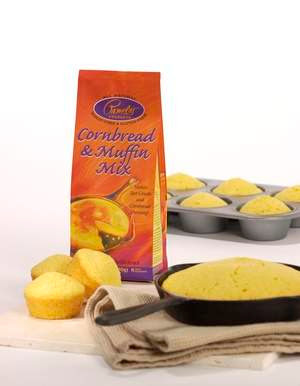 The Cornbread & Muffin Mix was quick and easy to make and had just the right hint of sweetness. I enjoyed it warm with melted butter on the top. I almost ate the whole pan that’s how good it was. This is one product you must try- you will not be disappointed! Oh the Chocolate Brownie Mix! As I sit here typing this post, my mouth waters!! The ewwy gooey brownies were simply delightful! They will please all my fellow chocoholics out there. 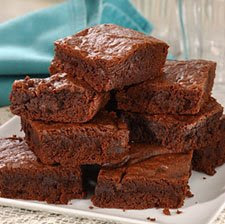 They were both rich and moist and one of the better brownie mixes I have tried. Excellent product! The Lemon Almond Biscotti was also really good. This is a sweet lemon cookie enhanced with crunchy almonds. It is perfect to enjoy with a cup of coffee. These went fast in my house. I wanted to mention that you don’t need to have food allergies or Celiac to enjoy Pamela’s Products. I don’t have either and I would definitely buy them again. I love that they have only natural ingredients and are a healthier and tastier option for my family to enjoy. So where can you find Pamela’s Products? They are available at natural food stores like PCC Natural Markets, Sprouts, Wegman’s, Whole Foods as well as many grocery stores such as Fred Meyer, Kroger, Publix, Safeway and Winn Dixie throughout the US, Canada and other countries. You can also buy them online at Amazon or through other online sites.